raising redheads: rare disease awareness day. This weekend was good. We took the kids swimming and they loved it. And I should have been enjoying it too. But I have to admit that in the midst of it all, as I was trying to laugh and help the kids have a good time, I was sad. We were at a birthday party for Ashley's little guy, Shawn. He turned one a few days before and we were celebrating. She had invited lots of moms who had lots of babies. All of which are looking around, and reacting. I got her in the water and stayed in with her for a long time. I'd love to say she liked it, but she didn't show any sort of reaction whether we were in or out. So I suppose she liked it. Which is good because I would like to look into some water therapy for her to try as she grows. 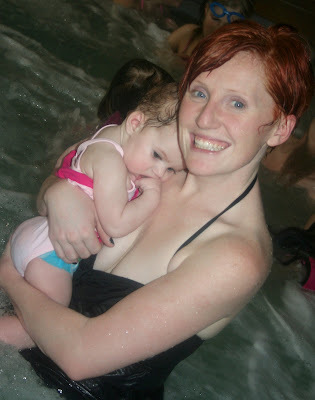 I wrote my post about trials and triumphs the night we went swimming, after I saw photos of all of us at the pool. Mabel looks the same in the pictures as she does to me everyday but for some reason I had a hard time looking at them. And I know I'll get past that. I know we're still just figuring out how to accept that things aren't the way we thought they were going to be. And it's hard. I don't want it to always be, but for now it's still all new. 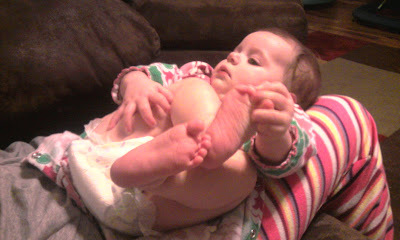 Last night, out of nowhere, Mabel reached for her toes for the VERY first time ever. It was intentional and she did it more than once. It was beautiful and exciting! She is almost 8 months old and I could have cried. Saturday night at 8 pm, Steffany went to Heaven. This is a photo of Steffy with her brother, Stevie. 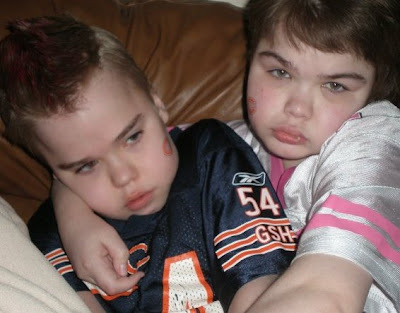 Both children have Sanfillipo Syndrome. please say a prayer today. And I hope we can all just be a little more aware that life can be really tough and seem really unfair. But our Jesus is still the same. He is unchanged. Unmoved. Our journey with Mabel is still very unknown. 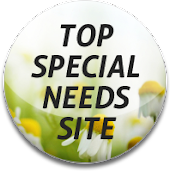 The syndromes that they have mentioned are so rare that I can hardly find information about them. It may seem scary at times but I also know that I want to live. I will not be consumed with fear. I will just love this lady and live. And the Lord has big enough shoulders to handle the rest. Mabel couldn't have a greater Mother. I know you don't feel strong but you are, and she is so blessed to have you. Ramee you are the strongest person I know, you are also the Kindest. You bless everyones life that has the chance to meet you, and for the few of us that consider you like family the joy you bring to our lives in so wonderful. I can't imagine how hard everything has been for you with Mabel, but you are an amazing mother and I know with you caring for her she will continue to make progress. I don't post enough well, just beause I feel as though I just have enough time to read but today I feel as though I must respond and let you know I have been and will continue to think about you all. I am not sorry but I am hopefully with Mabel. I'm not sure of the services that are available for you in your state but have you ever heard of Early Intervention? My youngest was in the EI system for gross motor when he was younger and I CANNOT say enough good thing about them. I use to be a sub TA before I had children and worked with EI children they are so beautiful. If you want go ahead and look them up. Steffany went to Heaven were we all will one day hope to be, Rest in Peace sweet Angel. My thoughts and prayers are with the family.